1 of 5 Line 8 1/2 x 4 1/2 x 2 5/8-inch loaf pan with plastic wrap, with plastic overhanging edges. Remove wrapping from 8 cakes. Press 4 cakes into bottom of pan, so the long sides of the individual cakes are parallel with short end of loaf pan. 2 of 5 Place loaf pan in freezer while softening ice cream. Let ice cream stand at room temperature for 10 minutes, stirring until consistency of cream cheese. Once ice cream is thickly spreadable, remove pan from freezer. Spread ice cream over top of cakes and to edges of pan. 3 of 5 Press remaining 4 cakes gently on top of ice cream, arranging in same manner as first layer. Tightly cover top of cake with overhanging plastic wrap. Freeze until fairly firm, about 3 hours. 4 of 5 Fold mint extract, if using, into thawed whipped topping. Once cake feels firm to touch, uncover top of cake. Invert onto platter; remove pan and plastic wrap. 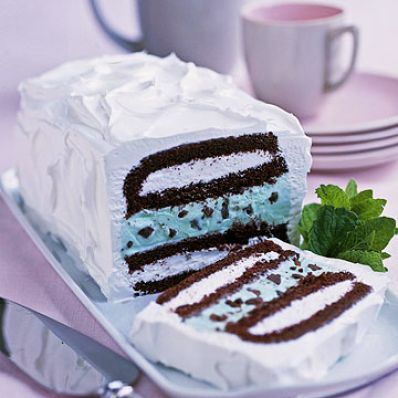 Frost sides and top of cake with thawed whipped topping. 5 of 5 Refreeze for at least 2 hours or overnight. Thinly slice and serve. Per Serving: 1 g fiber, 10 g sat. fat, 237 mg sodium, 46 mg chol., 41 g carb., 17 g Fat, total, 340 kcal cal., 4 g pro.